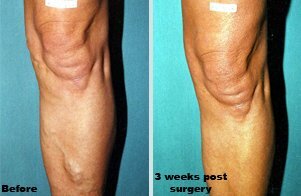 We are one of the only Centre’s in the UK for the treatment of abnormal veins using state of the art, minimally invasive technology. 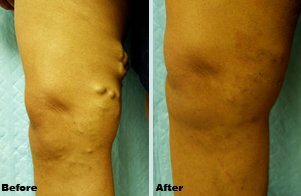 Clinical results have been published which document the success of endovenous laser treatment are significantly higher than stripping, which is no-longer accepted as the 'gold standard' treatment for varicose veins. 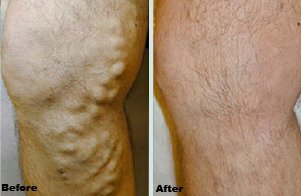 Endovenous laser therapy will normally treat most varicose veins successfully although additional therapy may be necessary for smaller and spider veins in some cases. 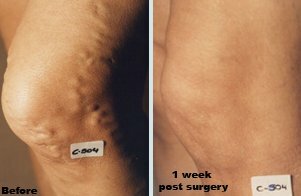 The pictures on the right show the results of endovenus laser therapy (EVLT) carried out on patients with varicose veins. After the procedure, you will be given a compression stocking to wear for 7-10 days. You may and should walk immediately. Thereafter, normal daily activity or light exercise is fine. You may have some bruising and soreness for 7-10 days after the treatment. This will usually respond to oral pain relieving medication as needed. In very few patients this may be more severe and may be eased with ice packs and rest. Any residual tightness in the leg should also have disappeared by this time.